Last month seven of the Willesden CC went over to Belgium for dietary purposes. The diet mainly consisting of beer, chocolate and chip consumption joined up by some modest cycling. We based ourselves in the charming little town of Poperinge close to Ypres. Our quest for knowledge regarding Belgian beers was relentless and thorough. A wide portfolio of brews were consumed along with some excellent meals. Mark relaxes after lunch or was it brekky? During the day we visited a number of WW1 battlefields and cemeteries. On two of the days we were able to see the remains of the trench systems for ourselves. 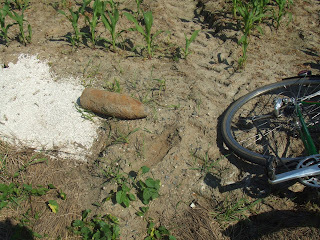 To this day the farmers continue to unearth unexploded shells whilst working the fields. On out last day Mark Brooking spotted the following shell awaiting collection by the bomb disposal team. The end of a great break was marred by the blatant discrimination of Norfolk Line ferries. They manage to empty a full car park of lorries and car into a ferry until there were just seven Willesden Cyclist remaining. They then closed the doors and made us wait for two hours for the next ferry, claiming there was no space for us. Mark Brooking was so incensed he went on hunger strike for four hours… it was that serious! Why did you not send this to Lindey to include in the Link. She is desperate for aticles and the ludites who haven’t computers would appreciate reading it. The Link takes what ever it needs from the blog.